Larson Electronics was founded in 1973 as an industrial lighting company. With over 40 years of experience in the industry, the business offers its products to customers in the following sectors: government, military, aviation, oil and gas, processing, manufacturing, marine and hunting. Our mission is to provide customers with high quality industrial lighting products through reliable sales support and expedited delivery services. We are a certified UL 1640 and UL508A panel shop, as well as CSA/CAN C22.2 No. 14 industrial controls shop. Our engineers are knowledgeable in the following industry standards and recommended practices: ANSI, ASTM, ATEX, IEC, IECEx, IES, NEMA, NFPA (NEC) and OSHA. Larson Electronics extends its offerings to customers worldwide. Today, our products are being used by manufacturing facilities, refineries, military bases, aerospace facilities and paint spray booths. Our specialties include explosion proof and hazardous location lighting and power distribution for permanent and portable applications. In the film and entertainment industry, our high grade luminaries have supported the production of several iconic television shows and movies, such as NBC’s Blindspot, Falling Water, War for the Planet of the Apes, Green Lantern, I am Legend and Batman vs Superman: Dawn of Justice. As a leading expert in the competitive commercial lighting sector, we participate in exhibitions and expos to influence the development of our business. In 2016, Larson Electronics attended the Global Petroleum Show in Calgary, Canada; and the Offshore Technology Conference in Houston, Texas. We also make contributions and donations to various organizations that rely on lighting equipment to expand their cause, such as the Wounded Warriors Anglers of America. Larson Electronics has continuously evolved to meet the needs and demands of fast-moving customers. As a pioneer in the development of new lighting technologies, the company has expanded its core products with the release of portable power distribution systems, explosion proof lights and masts. 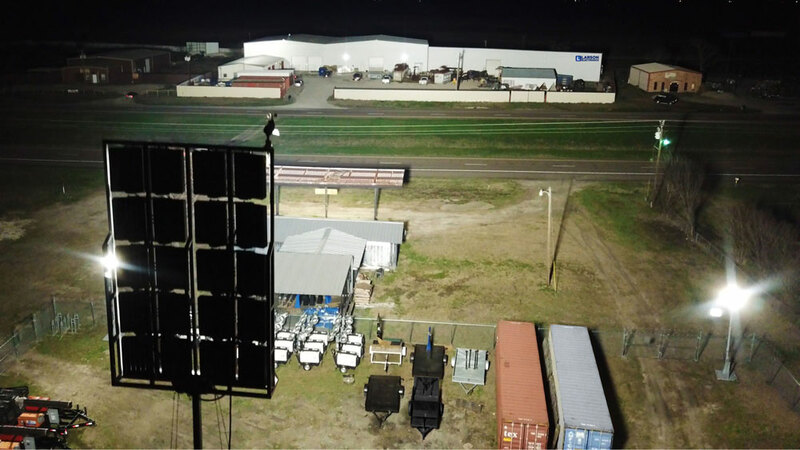 In 2006, the business started producing light towers, portable fixtures and high powered surface mount luminaries. We also offers customized fabrication for businesses with complex lighting and power distribution requirements. We have several mechanical engineers on staff to assist with complex fabrication requirements; master electricians to assist with power distribution design and construction; and lighting designers who can prepare lighting layouts for even the most challenging rig, crane or building scenarios. We are one of the few who say ‘Yes’ to your custom requirements and have the resources to back it up. With over 70,000 square feet of fabrication and warehouse facilities and nearly $5 million in fabrication equipment, including a variety of CNC lathes, mills, waterjet tables, plasma tables, CNC tube benders, CNC brakes, hydraulic shears, plate rollers, iron workers and other equipment, we are well prepared to build most any power or lighting solution to customer specifications. We pride ourselves at quoting quickly. We have people on staff day and night to generate quotes for stock products. We strive to put forth custom quotes on small projects within a day and more elaborate custom configurations within two days. Most products on the website that can be shipped via parcel or freight service can be shipped the same day. We stock light towers, light masts and most explosion proof lights for immediate same day shipping. Customers may place orders or requests for quote via the Larson Electronics website or by calling any of the numbers below. Most online orders from the website ship the same day, as long as it meets the cut off period of 5:30 PM CST. Replacement parts and accessories for our products are also available through us.